B. Moyer Radio Communications is a wireless communications company located in Palmyra, Pennsylvania. 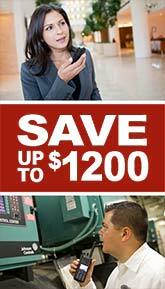 We are an authorized dealer and warranty repair center for Motorola and Kenwood two way radios. The next-generation professional two-way radio communications solution is here, with more performance, productivity and value - and more opportunity for you. With better basics and enhanced features, MOTOTRBO is Motorola's first digital two-way radio system specifically designed to meet the requirements of professional organizations that need a customizable, business-critical communication solution using licensed spectrum. The NXDN® Digital Advantage As signal strength decreases, noise and dropouts increase in analog systems thus degrading intelligibility. NXDN® signal reduces noise and detects and corrects digital errors before being heard by the user thus increasing the effective range beyond that of analog systems. formerly known as Kuhn's Radio Communications, LLC. All other product and service names are the property of their respective owners. © Motorola, Inc. 2017.